This configuration could (would) be “cut and pasted” 5 times to give 500MW and completely replace the old to power station. Brian: At the time of the launch you appeared to be well advanced with physical requirements, including having secured access to land for the project. Do you still have rights for the proposed site? Steve: There is no shortage of land in the area. We are in discussions with two landholders there so land will not be a problem. We are trying to get the best site that will suit the further expansion plans. 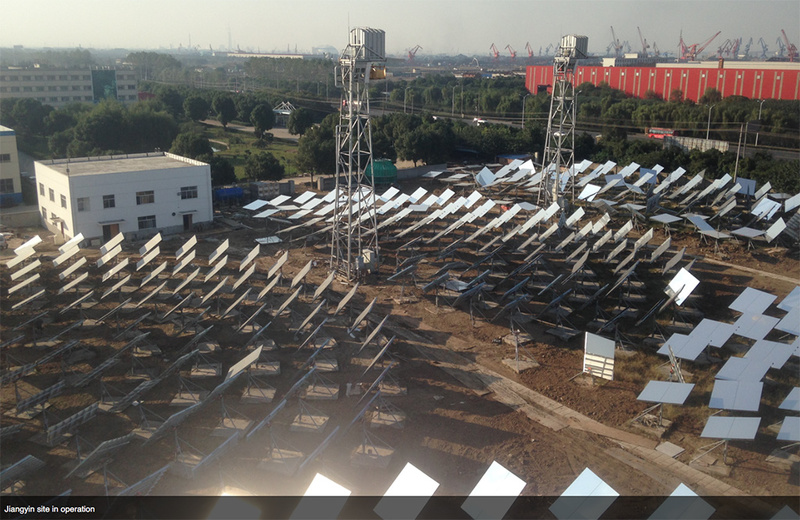 Each stage of 100MW requires about 250Ha. Brian: Do you have a planned commencement date and completion date for construction? Steve: We have the project itself now at a “ready to go” stage, meaning we have the Engineering, Procurement and Construction contractor and the Operation and Maintenance contractor in place as well as the finance. So the program now depends on reaching agreement with the Government on the proposed commercial arrangements and then the approvals process. This is all do-able by December this year, which would mean a start in early 2018 and commissioning in 3rd quarter 2019. Brian: Have you encountered any political roadblocks that are delaying your progress? Steve: No, we are going through the “Unsolicited Proposal” process and the Government is being very supportive and helpful so far. Brian: What is the significance of the departure of John Hewson as Solastor chair? Steve: John Hewson was never Solastor Pty Ltd Chairman. He was chairman of Solastor Australia Pty Ltd, set up to be the project company. The project company has been renamed Port Augusta Graphite Energy (obviously to differentiate us from other storages!) He is the Chairman of PAGE. He is still very much involved. Brian: Would your proposed development be viable under the existing National Energy Market rules or would there need to be changes for you to proceed? If changes are needed, what would be the most important? Steve: We believe we can operate under the existing rules. We propose to register as a “semi-scheduled generator”. That enables the plant to operate and dispatch whatever energy it wants to (although the Australian Energy Market Operator (AEMO) can restrict output if there is congestion and an oversupply). Whilst the plant can deliver baseload as noted above, it will more than likely operate for shorter periods than 24 hours and certainly cover the peak periods. Brian: Have you secured sufficient funding to proceed with the 1,700 collector project? Steve: Yes (800 collectors initially). Brian: Are there major technical issues that you have not yet resolved? Steve: Not really. We have to sort out whether water cooling is viable which will depend to some extent on the final site selection, or whether we will have to use water cooled condensers. We have submitted a grid connection application and have yet to have that confirmed. Nothing else at this stage. Brian: Where do you expect to manufacture the reflector mirrors and the collector units? Steve: Local (meaning South Australian) manufacture and fabrication will be maximised. Some components must be imported as they are not available in Australia (such as the graphite, the special alloy heat exchangers, the heliostat motor/drives and of course the steam turbines), but the rest will be local. This entry was posted in Activism, Climate change, Environment, Renewable Energy, Technology and tagged 350.org, activism, AYCC, climate change, environment, renewable energy, Repower Port Augusta, solar power, sustainability by Brian Loffler. Bookmark the permalink. I was lead to believe the graphite required was to be purchased from a local company Lincoln Minerals. What’s changed and wouldn’t it be far more sensible to buy local products? It’s now over a year since you wrote this post…. any news on how this project is progressing? A quick search online reveals very little. Can you please confirm the status of the plant, Cancelled or still in planning phase? I don’t have any fresh information direct from Solastor, but my understanding is that Solastor have cancelled their plans for Port Augusta, presumably because their competitor SolarReserve won the tender for supply of power to the SA Government, with their Aurora project which uses solar reflectors and molten salt storage. You can track progress on this project here: https://www.solarreserve.com/en/global-projects/csp/aurora/ The most recent update I’ve had (August 2018) is that SolarReserve is still in the process of appointing the EPC (Engineering, Procurement and Construction) Contractor. Solastor appear to be concentrating instead on a project in Cyprus: https://solastor.com.au/news-events/ But there haven’t been any updates on this for several years.